I have a bumper packed weekend where I have two weddings on Saturday and Sunday and a workshop with TemptuPro. Now that has me really excited as I get to meet the people behind the brand and they can help me fix wherever I go wrong in the application of airbrush makeup. Here's the funny part though - I have to leave part of the workshop on Sunday in order to do the wedding and come back in the afternoon. This wedding was already booked prior to the workshop so there is no way I can re-schedule. I'll keep my fingers crossed that everything goes well. I will carry my trusty camera for pics for both weddings and the happenings of the two day workshop. I just came back from preparing a Hindu Bride for her wedding in Claxton Bay and we wanted to achieve the Bollywood Look for her Hindu portion of the wedding. She has such fair skin that we just wanted to lightly contour her face without distorting anything but she asked for very dramatic eyes. I did a winged liner with MAC Kohl pencil and lined inside her eyes to continue the drama effect and used Loreal Mascara for the eyelashes. We kept the lips simple with a lip pencil from Jordana and Loreal Infallible lipstick in crimson. 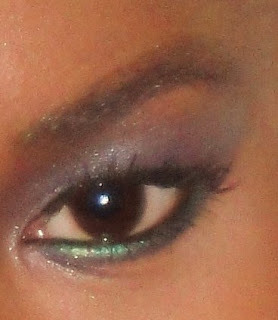 Of course, without stating the obvious, I used airbrush makeup in OCC and Graftobian Powder/Foundation palette in Neutral. I am very tired right now but I really wanted to put up these pics of today's wedding. I went to San Juan for a bride and bridal party and it was another fun today but this time a little more hectic. One of the ladies (the first pic) had a serious sweating problem and that was affecting the makeup to the point that it was not setting on her face. 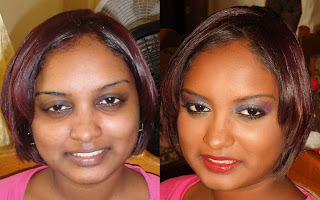 I thankfully did not panic after a little while and had to matte it down with a sponge and then re-applied the airbrush makeup onto her face. 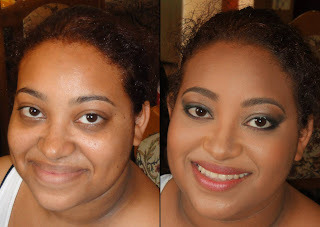 I used OCC Makeup and Coastal Scents Lip Palette on everyone and had to rush to make sure the bride was ready to dress and leave on time. 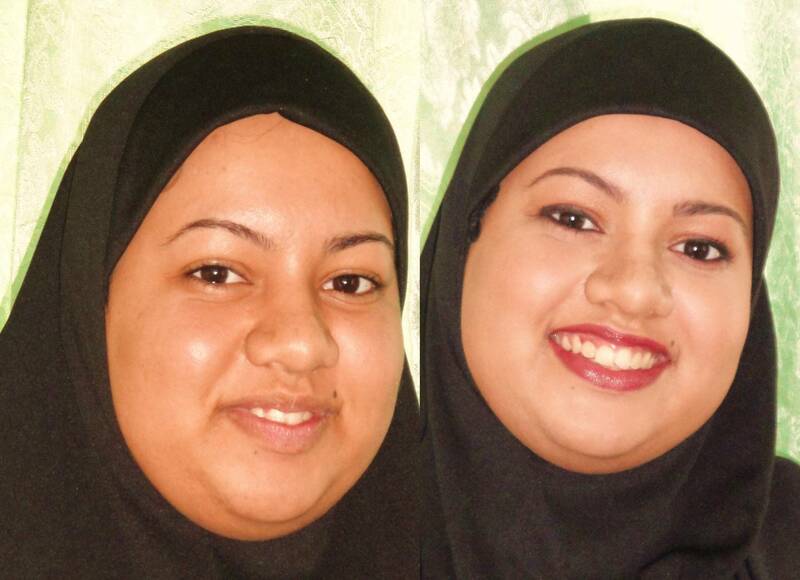 Sorry I couldn't go into more detail today regarding the makeup, but I will do so for tomorrow's Hindu Wedding. That should be interesting and pretty. Today I had so much fun with this bridal party in San Juan. They contacted me over a couple mths ago based on another wedding I had done for a Muslim Bride (you can check back my earlier posts for it) and they were impressed with the simplicty and flawless look I gave her. I didn't do a trial so I wasn't sure what I was going to meet but was glad that they all had somewhat good skin and were so excited to get airbrush makeup done. A couple of them inclusive of the bride had sensitive skin so I was extra careful to ensure that the products were properly sanitized prior and after application for each of them. All they asked for was a little drama on the eyes and definite liner to accentuate. I used OCC Airbrush Makeup and Coastal Scents eyeshadow and Ben Nye Fireworks Wheel to highlight. The tranformations were subtle but effective for each of them but not everyone wanted to take out Before Pics...that 's ok though, the Afters were great! The bride is in white ( of course) & gold. Just Beautiful! Yesterday I was so happy to be in my hometown to do a wedding...it meant that I would've been able to relax a bit before getting ready to prepare the bride and mother of the bride. The only thing that was a concern was the weather...it was so cloudy and rainy, she was concerned (and rightly so!) about her outdoor pics. I'm not sure how it turned out though but when I left it had stopped and I do hope everything went well. Anyway, my focus today is to show how airbrush makeup affects women of very ebony skin tones. 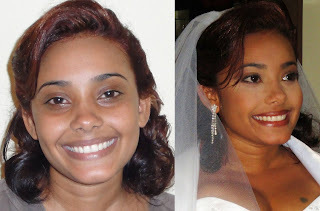 The mother of the bride is ebony skinned but also has serious discolorations, however, its not placed in the regular places, in fact it was in the inner portions of her face as opposed to the typical placement of the face perimeter (outer parts of the face). 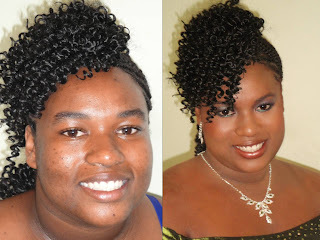 I used TEMPTUPRO S/B for her and the bride to ensure that there was longevity of the makeup especially in relation to the weather and I like that TEMPTUPRO carries 12 shades which will ensure that dark to ebony skin tones will be covered. As you can see here, around the eyes and mouth are really dark. So I decided to use Shade 011 in the S/B Collection and created a flawless canvass that was lighter, more in keeping with her hairline. I also notice that women of dark skin tones are afraid or stay away from dark shades of e/shadows. I used on her eyes Ben Nye Fireworks Wheel cream makeup a Bronze shade as a base and Coastal Scents Shimmery Grey as the main color. It was as expected very sultry and yet simple. 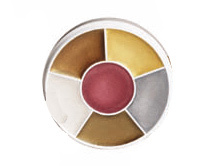 This wheel from Ben Nye is incredible and flexible as it can be used on any part of the face & body. The end result was suprising to all of us as it took years off of her face. She was fun to work with and I hope that they had a wonderful time yesterday! GRAD MAKEUP! GRAD MAKEUP! 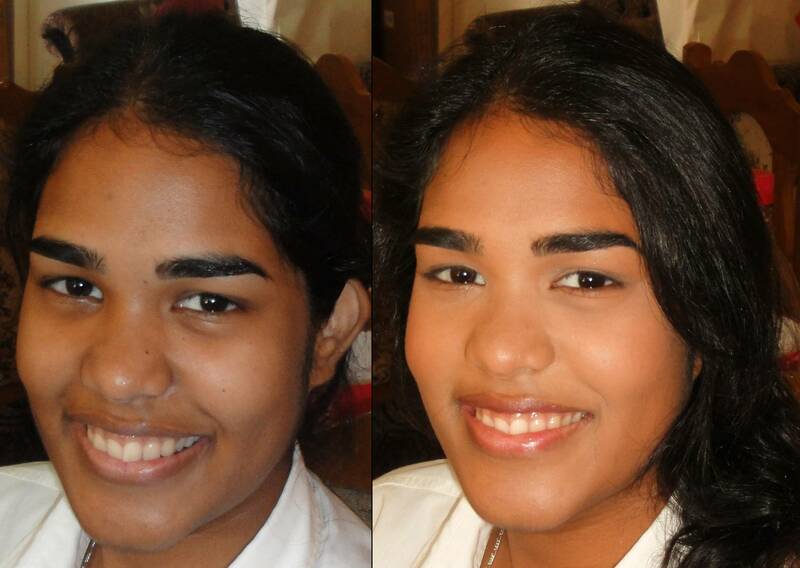 GRAD MAKEUP! I'm baaack blogging and I know it took awhile but I was really busy every weekend and today was the first time since my last blog that I could take the time to actually write something for you readers. I took liberties here to make the makeup look fresh, flawless & also fun. The most fun for me was the eyes, of course. Her makeup was airbrushed with TEMPTUPRO S/B as she had serious acne scarring so I wanted complete coverage and I know that this brand could do that...Contouring was applied but remained soft as she was transitioning from afternoon into evening and I didn't want to go overboard as per her age as well. 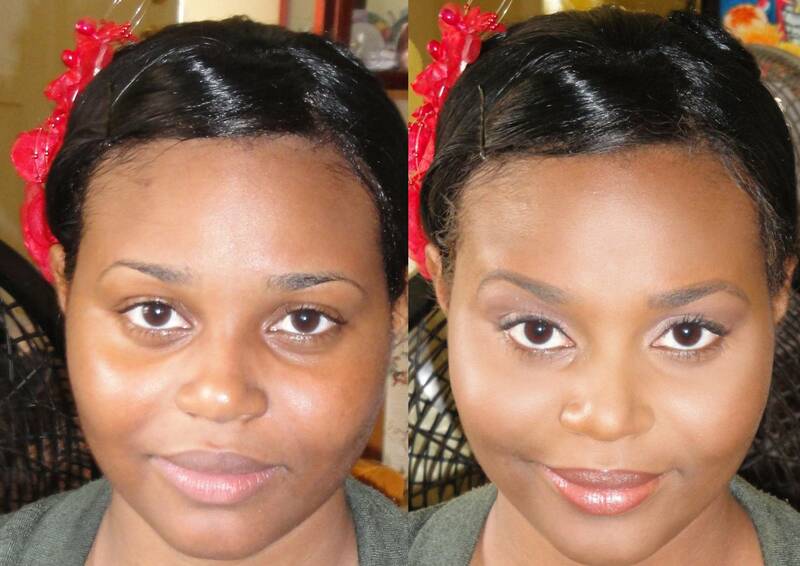 Her eyes were also shaped and contoured starting with the eyebrows (wow! lol) and I used two eyeliners under the eye with complimentary colors - bright green & purple but the second color is not coming up too well in this pic. Believe me though, the color combo was stunning!! I just winged up the shimmery eyeshadow and made sure the double under-eye liners followed suit. Check them out below and enjoy!! !